NETWORK UPDATE: The AFC CHAMPIONSHIP GAME adjusted to 13.9, which is a huge number, but far below the 19.0 for last year’s primetime NFC game. The post-game SCORPION was up 0.2 from early numbers to 3.2. RESURRECTION rose 0.1 to 0.8. Even though it fell 0.3 in adjusted numbers, the viewers of the afternoon NFC game on FOX hung around sufficiently for MULANEY to retain a 1.2 rating, tremendous by its standards. The 8PM rerun of THE SIMPSONS and NBC’s run of BRIDESMAIDS both gained 0.1. The battle for Sunday’s cable lead was neck and neck between two contrasting demos: Bravo’s REAL HOUSEWIVES OF ATLANTA, while down a huge 0.35 from last week, was on top with 1.36 (including 1.61 among Females 12-34), while Fox Sports 1’s UFC FIGHT NIGHT was at 1.35 (including 1.29 from Men 50+). 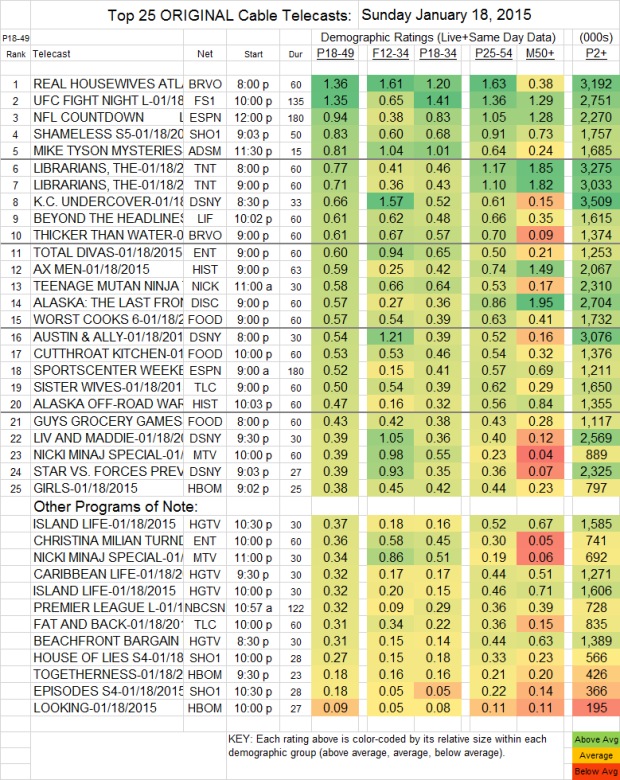 On Bravo, HOUSEWIVES was followed by THICKER THAN WATER, down two-tenths to 0.61. TNT’s THE LIBRARIANS ended its season on a slightly lower note, at 0.77/0.71 for its 2 hours compared to 0.85/0.77 last week. Showtime continued to win the battle of pay-tv, with SHAMELESS up 0.03 to 0.83, HOUSE OF LIES down 0.06 to 0.27, and EPISODES up a tick to 0.18. On HBO, GIRLS was down 0.01 to 0.38, the 2d episode of TOGETHERNESS was down 0.05 to 0.18, and LOOKING remained at 0.09. Adult Swim’s MIKE TYSON MYSTERIES grew by 0.11 to 0.81. TOTAL DIVAS (E!) lost 0.07 to 0.60, followed by CHRISTINA MILIAN TURNED UP at 0.36. History’s AX MEN stayed at 0.59, with ALASKA: OFF-ROAD down 0.01 to 0.47. Discovery’s ALASKA: THE LAST FRONTIER fell 0.11 to 0.57. MTV’s NICKI MINAJ SPECIAL was at 0.39/0.34. SISTER WIVES (TLC) was steady at 0.50.